Watermelon is a fruit that everyone likes. During the summer months the demand for this fruit increases as it a good source of water and natural sugars. But have you ever thought about how beneficial its seeds can be? Most of us throw away the seeds without knowing that they are the store houses of nutrients, proteins fatty acids, vitamins and minerals. It is also rich in calories. 100 gm of watermelon seeds provide you 600 gm of calories. Watermelon seeds are as good for the skin as they are for the health. It provides you a glowing and healthy skin. Watermelon seeds contain unsaturated fatty acids, which are essential for keeping your skin moisturised and hydrated, as well as in keeping the skin well-toned. It also helps in preventing acne and a number of other skin disorders. So have watermelon seeds regularly. The antioxidants present in watermelon seeds help in reducing the signs of ageing. 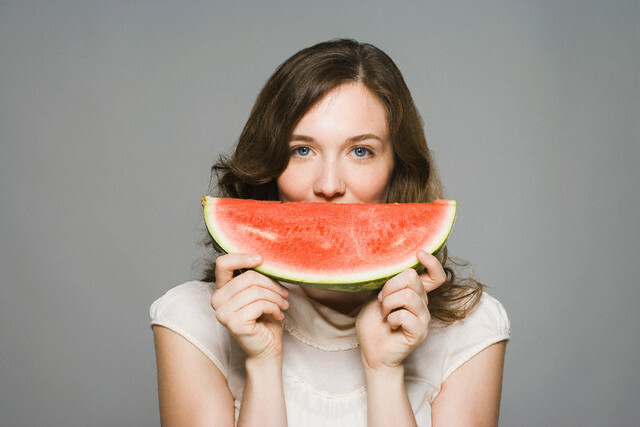 By taking watermelon seeds regularly, your skin will look young, more healthy and glowing. All you need to do is to have a handful of watermelon seeds every week. You will be amazed at the results you get. The oil extracted from watermelon seeds called Ootanga oil or Kalahari oil is excellent for your skin. It is light in texture and therefore does not clog the pores in your skin nor interrupt with the normal functioning of your skin. It is also excellent for moisturising your skin and keep it hydrated. It is also an unavoidable ingredient in the baby oil. When you go out, sebum, grease and dirt accumulate on your skin and clog the pores of your skin. This causes the formation of pimples and acne on your skin and also makes your skin look dull. By applying watermelon seed oil on your skin the pores get unclogged and your skin is made free from pimples and other skin problems. It is applied on all types of skin, whether it is oily, dry, maturing skin or prone to acnes. The extract of watermelon seeds is excellent for preventing the moisture from escaping from your body and therefore slows down the signs of age. It is also good for maintaining the elasticity of your skin. Certain skin cancers and skin infections are also avoided by the nutrients present In watermelon seeds. The essential fatty acids present in watermelon seed oil help in moisturising the scalp and also prevent breaking of the hair. The rich protein content of the seed is good for maintaining healthy and glowing hair. The copper present in roasted watermelon seeds helps in the production of melanin, which is the pigment that is responsible for lending color to your hair. So having roasted watermelon seeds helps in preventing premature graying of the hair. The oil obtained from watermelon seeds is very light and when applied on the scalp, does not clog the pores. So no dirt or dust accumulates on your scalp. The oil moisturizes your scalp and hair and is useful for a healthy hair and scalp. Watermelon seeds are very beneficial for the diabetic patients also. Take a handful of watermelon seeds and boil it with one liter of water for about 45 minutes, keeping the vessel closed. Now take this concoction every day just as you drink tea. You will see the difference it makes to you. 100 gm of watermelon seed provide you about 139% of the magnesium that is needed by the body daily. This is essential for the normal functioning of the heart, to maintain the blood pressure, protein synthesis and for the maintenance of metabolism. Lycopene contained in watermelon seeds is good for your face. It also improves fertility in males. Amino acids are very essential for the body and the body is capable of producing them. But some of thee essential amino acids like lysine and arginine cannot be produced by the body. You get it only through food that contains them. Watermelon seeds contain these amino acids in plenty. Lysine is required for the absorption of calcium and helps in the formation of collagen and connective tissues. Arginine is needed for the improvement of metabolism, sexual health and cardiovascular system in the body. Watermelon seeds are rich in multivitamin B like thiamine, folate, niacin, riboflavin, pantothenic acid and vitamin B6. These are necessary for your nervous system and to maintain healthy blood in the body. They are also needed to increase the immunity of your body. Among the various constituents in watermelon seeds, about half of it include oil.20% of this oil consists of saturated fat while the rest includes monosaturated and polyunsaturated fat, which also include omega-6 fatty acids. If you take one cup of dried watermelon seeds, you will get about 50 gm of fat, of which 80% constitute the fat needed by the body every day. So if you want to get more calories and energy, include watermelon seeds in your daily diet. Most of the people tend to suffer from protein deficiency, especially in poorer countries. This leads to many diseases like kwashiorkor and marasmus. Watermelon seeds are rich sources of protein and consuming them regularly helps in treating protein deficiency to a great extent. One cup of dried watermelon seeds provides you 30 gm of protein. Protein and amino acids essential for the growth and repair of muscles, connective tissues and skin. It is also vital for the production of enzymes. For long and strong nails you need protein. Watermelon seeds are very effective in increasing and sharpening your memory and for recovering your health after an illness. With so many benefits of watermelon seeds, do not throw away the seeds next time when you east watermelon. Use them and see how they make you healthy and strong.